Citation Information: JCI Insight. 2017;2(9):e93009. https://doi.org/10.1172/jci.insight.93009. Simulated average number of detected genes by the number of mRNA transcripts sampled from simulated single cell transcriptomes. Three sizes of a single cell transcriptome were simulated: 50,000 (blue); 250,000 (green); and 500,000 (red) mRNA transcripts. The simulation was based on gene frequencies from bulk HEK293 polyA RNA-seq data with 18,101 distinctive genes with 100 iterations for each point. (A) Complete graph for sampled simulated single cell transcriptome sizes from 1–500,000. 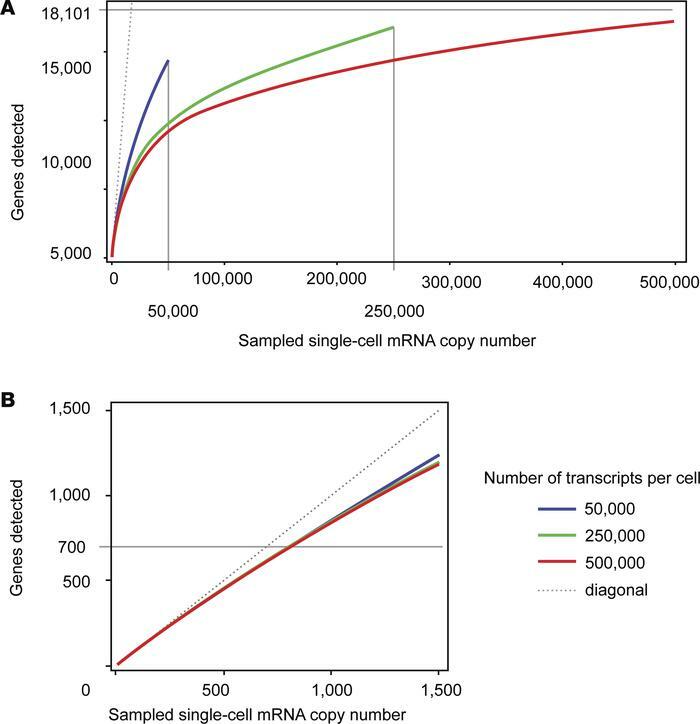 Because simulated single cell transcriptomes almost never have all 18,101 genes detected in bulk RNA-seq, the average number of detected genes is asymptotically approaching the maximal number of genes with an increase of the size of simulated single cell transcriptome. (B) Enlarged fragment of near-linear part of A corresponding to the approximate number of genes detected in individual cells (700 genes). The gray dotted diagonal (y = x) represents a hypothetical linear relationship between number of transcripts sampled and number of genes detected.